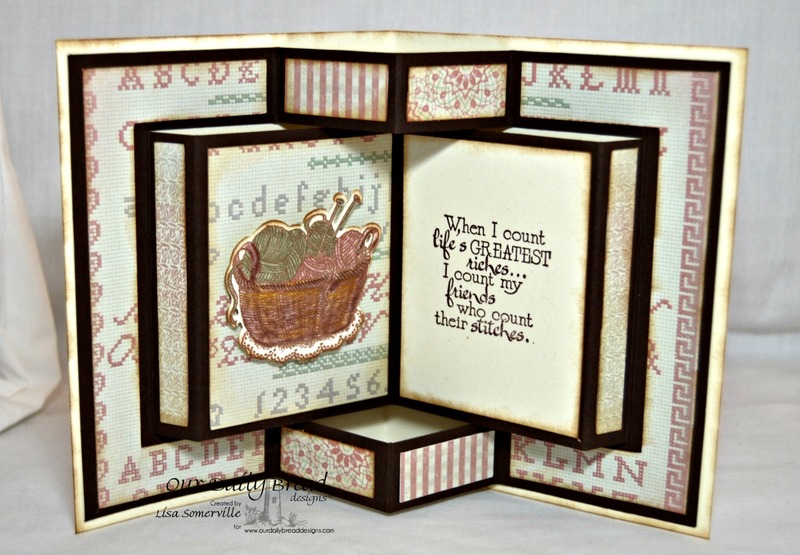 I created my book card using stamps, dies and pattern papers from Our Daily Bread Designs. I love the quote from the Stitches stamp set, here I paired it up with the basket of yarn from the Hand Knit stamp set. I added color to the image using STAEDTLER Karat Aquarell Watercolor pencils, then die cut the stamped panel using the ODBD Custom Knitting Basket and Yarn Dies. The beautiful papers are from the Soulful Stitches Paper Collection. Lovely card. How did you make the main base card? Was it just measuring and cutting or did you use a die? Oh, Lisa, you sure make the most amazing dimensional cards, and this one is fabulous! I love the die cut of this one!! Just love the knitting theme and agree about this great sentiment!! Thanks for supporting the ODBD Shining the Light challenge this week with us!! It's beautiful! Hugs, sweet friend! Beautiful! I have not seen that design before, you sure "done it good"! Woman, you artistic talent knows no bounds! Exceptional card! Thanks for supporting our stitch challenge! Wow Lisa!! You are certainly the queen of folds. I love this and will have to try it myself sometime. Very inspiring!! It is perfect with the cross stitch stampler dp!! It shows it off beautifully!! Thanks for supporting the Shining the Light challenge! !